Location: Near Sulitjelma, east of Bodø, Norway. How to get there: The starting point for this climb is the small village Sulitjelma. Sulitjelma used to be a mining town, however the mines are closed and the community is partly looking like a ghost town today. They do however, have a pretty nice hotel that can be recommended for accommodation. From the city of Bodøo, drive east to Fauske on E-80. Fauske is also a railroad station and the main Hwy. E-6 runs through here. In Fauske, locate the sign for Sulitjelma (going further east). The road from Fauske to Sulitjelma is a bit more than 30 kilometer. In Sulitjelma, locate the church up on your left, shortly after entering town. Drive up to the church and park there. This is the trailhead, location N67:08.151, E016:03.410, elevation 147 meter. Route description: The first part of this route runs from the church and up to the DNT self-serve hut called New Sulitjelma. This hut has no food, is locked with the DNT standard key, and offers rather luxurious accommodation for NOK 75 (2007) per night if you are a DNT member. The hut has electricity, full kitchen facilities as well as a special heated cabinet for drying wet clothes and/or boots etc. The hut is located at elevation 585 meter. To get there, follow the small road that starts just above the church and runs on a long gentle uphill, first passing a few houses called Giken at about 200 meter of elevation, then climbing further to an antenna before the terrain levels out as you approach the hut located just west of Tverrfjellet. From the New Sulitjelma hut, the route continues along the road west of Tverrfjellet, then climbs more distinctly east to about 800 meter of elevation. From here, you will see the impressive mountain Stortoppen (1822) (or actually its west shoulder, Vardetoppen). Head up the shallow valley that will lead you to the right side of Vardetoppen on a south-east course. Another mountain with a pretty flat top will appear further ahead. When you reach the saddle at approximately 1050 meter (north of point 1090), contour around the slope above Otervatnet (941m) and continue just north of point 1088. You will pass a hut near this location. The route now turns into the nice valley between Otertoppen (1546m) and Stortoppen. Right ahead (uphill) is a fairly steep glacier coming down the slope. The normal route proceeds directly up this glacier at the leftmost side. There is a short stretch of about 50 meter that is fairly steep, it may be most convenient to carry the skis and walk up this section. Be careful with possible crevasses late (or early) in the season. 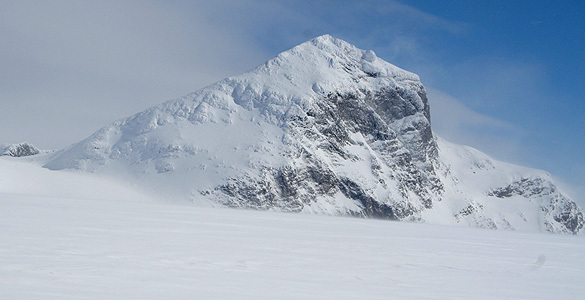 From visual inspection, an alternative route may climb the north slope directly towards Stortoppen to about 1300 meter, then traverse east on a distinct, but outward sloping ledge in order to reach the top end of the steep glacier. This latter route may have more avalanche danger and the route has more exposure since it traverses above steep cliffs. Thus, the normal route described above is likely the safer option. 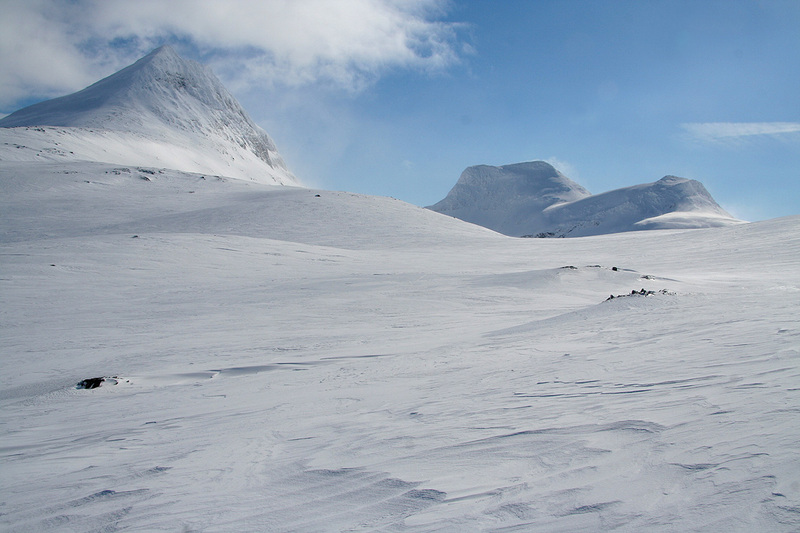 You are now on the main glacier plateau with Stortoppen behind you and Knekten, Dama, and Suliskongen lined up ahead. Cross the glacier and head directly towards the steeper glacier coming down between Dama and Suliskongen. A course that ends at the left side, just below Dama is best. You then gain another 200 vertical meter while climbing this glacier, the slope is rather moderate and good for skiing. (Again, beware of possible crevasse danger.) When reaching the top ridge connecting Suliskongen and Dama, the remaining route is directly up the north face of Suliskongen. This last vertical is about 300 meter. The slope can be skied or walked on foot depending on the snow conditions. 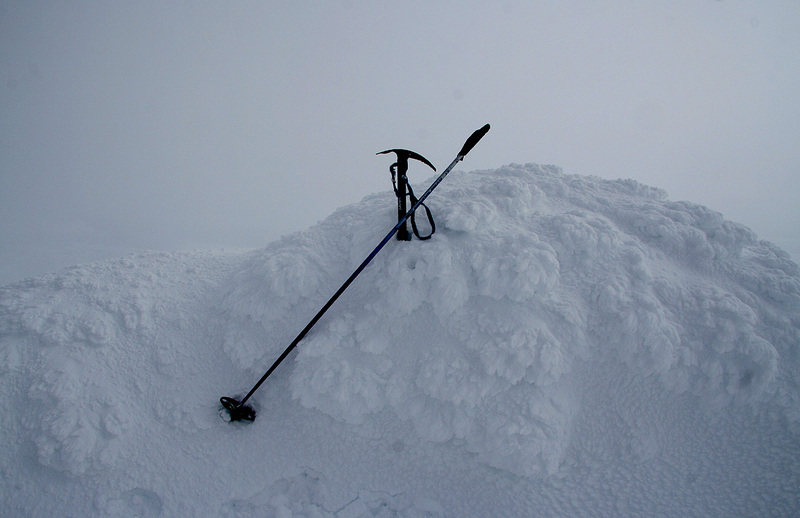 Be careful when approaching the cairn as there may be cornices overhanging the vertical cliffs. Comments: In 1973, I skied through the Sarek National Park in the winter, then did a summer hike the following summer. On both occasions, we came west to Sulitjelma and wanted to climb Suliskongen along the way. No luck due to bad weather. In November 2005, I signed up for a Bodø Mountaineering Club climb of the peak and took a flight all the way to Bodø only to discover that the trip had been cancelled. Thus, it was high time to finally make this climb. I had a light meal at the Sulitjelma hotel, then skied up to the New Sulitjelma DNT hut in the early evening. Later, a couple arrived and I recognized Therese from my trip to Breidviktinden in November 2005. A nice evening as a few more arrived in preparation for a Fauske based organized trip to Suliskongen the next day. The next morning looked gorgeous, blue sky and white mountains. The organized group would likely not start out from here until around 1100. Given the nice weather, I decided to make this trip solo, the disadvantage of not knowing the route being outweighted by the opportunity to enjoy the good weather. I started out at 0900 and skied without problems to the base of the first (and steepest) glacier. I took a conservative route and descended too low towards the lake Otervatnet, then skied up the narrow valley south of point 1088, since it was hard to judge if a traverse would enter the glacier area in a convenient way without looking at the map. The glacier was steep enough to be climbed with skis on the backpack, a very strong gusty wind came straight down from the plateau above. Once on the plateau, I could enjoy the fantastic scenery that these mountains offer. It was warm and still sunny. However, as I started up the second icefall between Dama and Suliskongen, I noticed clouds that rapidly spread from the north. I left the skis at the saddle and decided to climb the last 300 vertical meter on foot, since the icy crust gave little grip for my skis. Unfortunately, the crust did not support my weight and sinking into the snow for almost every step turned this final climb into a pretty streneous job. I arrived at the summit cairn at 1345, 4:45 after leaving the DNT hut. It had been a nice day, but now the summit was engulfed in clouds and the visibility (and therefore view) had all but disappeared. I headed back down shortly before 1400 and met the Fauske group as they prepared a major rest at the base of the upper icefall, near the base of Dama. The rest of the trip experienced wind, clouds and some snow. I was happy about my decision to leave early, the Fauske group still having quite a long way to go in less than ideal weather. I was back at the DNT hut around 1630, altogether about 7.5 hours in extremely nice mountains. After a rest, I cleaned out of the DNT hut and skied down to Sulitjelma and decided to treat myself to the luxury of a dinner and night at the Sulitjelma hotel. They have a nice indoor pool and outdoor jacuzzi as well. The next morning, I would drive to Fauske in order to pick up Geir Åke Dahlen arriving with the overnight train. 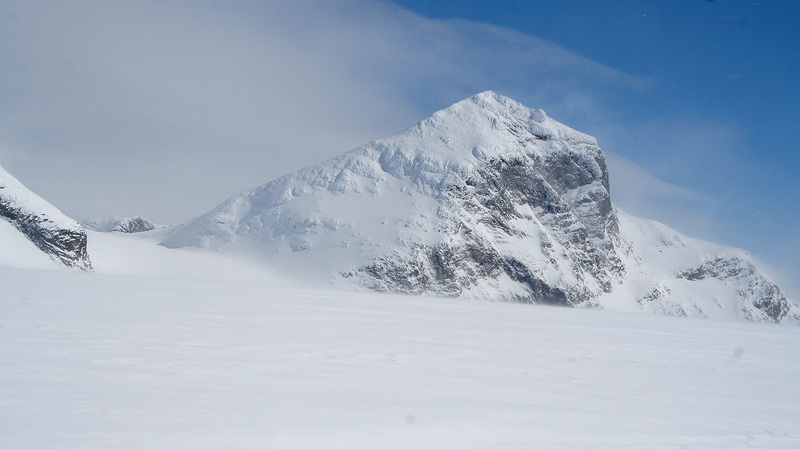 We had planned a pretty ambitious schedule for the coming days, first on the agenda would be an attempt on the very unique mountain called Nord Saulo. 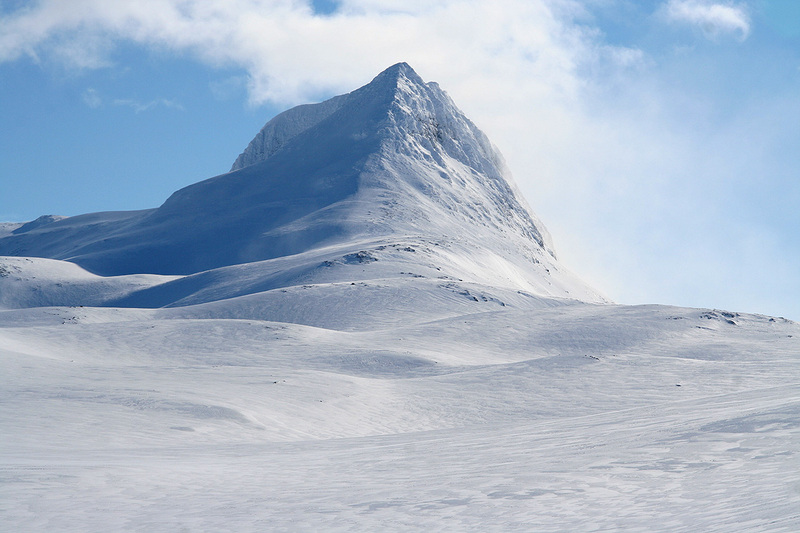 Stortoppen (1822m), the first summit that comes into view. Morning view, the route proceeds up to the right, towards the flat top mountain. A bit later, the route traverses left just after this col and enters a narrow valley between the two mountains. View on the glacier. From left to right, Knekten (1711m), Dama (1781m) and Suliskongen (1908m). Note that clouds are closing in from the north. The summit of Suliskongen. This is the cairn. Not a step further, cornices all around. The Sulitjelma mountains as seen from Juhtar, 785m.